BALTIMORE, Md. 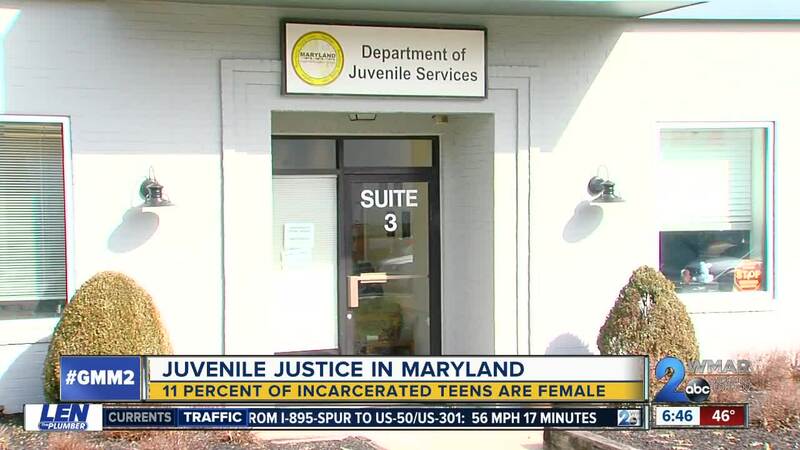 — The hundreds of kids incarcerated in Maryland every year spend about four months committed to a residential facility. Many of those teens are counting the days until they’re free to go home. WMAR-2 News spoke with two young persons who have already been released. One young woman’s personality doesn't match what you would expect from someone who has had several run-ins with the law. Since she's been able to put her past behind her, her identity is being kept anonymous. She’s calling herself “Vanessa.” She is not showing her face or using her real name as she opens up about her life. “When I first came home, I was scared. I was frightened. I felt like I wasn’t ready to come out. I actually told one of my supervisors I don’t want to come home, I want to stay. I know it sounds weird, but I wanted to stay,” Vanessa said. Fear of an uncertain future was another reason she wasn't so anxious to leave. “I wanted to get my high school diploma because I knew myself. I knew that I wasn’t going to come out and go back to school. Like, I just felt like I wasn’t. All the promises that I made to myself, I knew that I wasn’t going to do it when I came home,” Vanessa said. “Vanessa” has since completed her time in the program, and has been released from the juvenile justice system. “I want girls, and boys I guess, to know that we can change. Don't let anyone tell you, you can't do it, just because you've been in the juvenile system. I came so far, and I look at life so differently now,” Vanessa said. Looking back on her life, we asked “Vanessa” if there’s anything she would do differently and what would she change. “Do you want me to be honest with you? I wouldn’t change one thing. No. Because I learned from my lesson. I learned a lot and I wouldn’t go back,” Vanessa said. After being convicted and committed to a secure facility for teens, 19-year-old Lamar couldn’t be happier to put that part of his life behind him. “No longer a resident of Victor Cullen, or any DJS facility. It feels good just to make my own decisions whenever I want to make them. I just love the feeling of freedom,” Lamar said. For many who’ve made their way through the juvenile justice system, being free means a fresh start. After Lamar earned his GED, it also means achieving what was at one time unthinkable for most. “I started several college courses, started so I can go to BCCC this summer, for the summer semester,” Lamar said. Once free from the halls of their incarceration, some teens are drawing on their past experience to choose a new path to shape their future. “Bill” shared what the future holds for him. “Virginia Tech, if I go to night school. I’m going to go for criminology, and for Maryland University, I’m going to go for secondary education,” Bill said. It’s not just a desire to go to get a college degree, but a desire to inspire. “I’m going to have my own mentoring program for youth, boys and girls alike, especially that live here in Baltimore,” Lamar said.